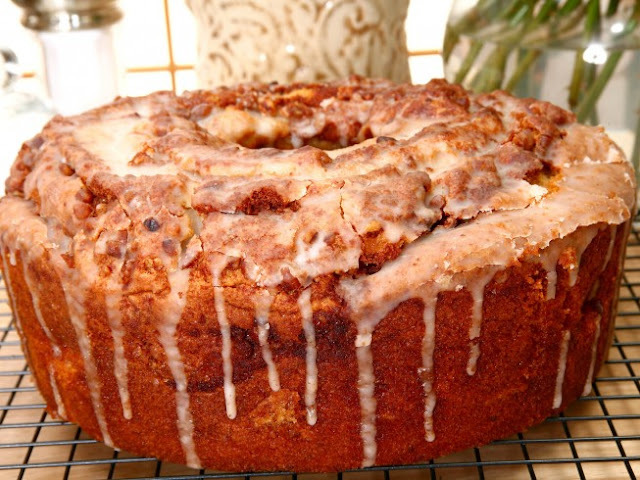 This classic coffee cake is filled with pecans, brown sugar, and cinnamon and drizzled with a sweet glaze. Preheat oven to 350 degrees F. Grease a tube pan. In a mixing bowl, combine the cake mix, sugar, and oil an mix until just blended. With the mixer running, add the eggs one at a time. Mix until incorporated. Add the vanilla and sour cream to the batter and mix well. Stir in the pecans by hand. Pour half of the cake batter into the prepared tube pan. In a bowl, mix the brown sugar and cinnamon until blended. Sprinkle the mixture over the cake batter in the pan. Gently pour the remaining cake batter into the tube pan over the cinnamon and sugar layer. Do not stir. Place the tube pan in the oven and bake at 350 degrees F for 60-65 minutes or until the cake tests done with a toothpick. Meanwhile, in a small bowl mix together the confectioners sugar and milk (or juice) until smooth. Set aside. When the cake is done, remove from the oven and let cool on a rack in the pan for 5 minutes. Place a piece of waxed paper under the cooling rack. Invert the tube pan onto a plate and remove the cake. Invert the plate onto the cooling rack so the cake is right-side up again. While the cake is still warm, drizzle with the glaze. Let the cake cool completely before slicing and serving. 0 Response to "Sock It To Me Cake"